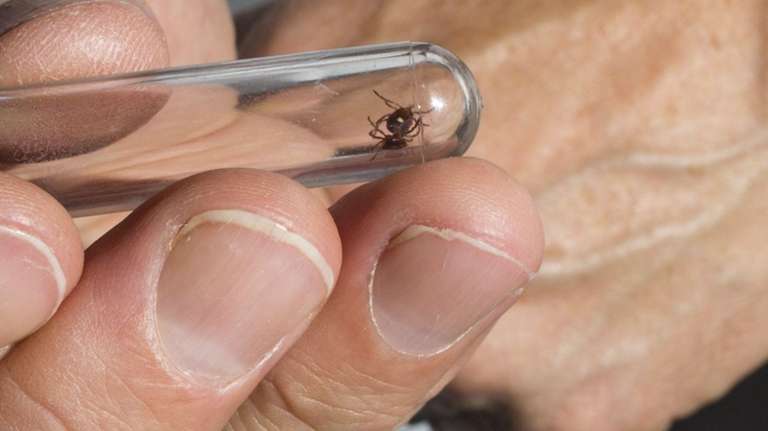 Tick-borne infections have reached epidemic proportions on Long Island, where children are disproportionately affected by Lyme disease and other infections transmitted by the eight-legged creatures, a panel of top scientists said Thursday. “Lyme disease is mostly a disease of children and curiously mostly a disease of boys,” Jorge Benach said at Thursday’s symposium at Stony Brook University School of Medicine. Benach, who discovered the bacterium that causes Lyme disease, is a molecular geneticist at Stony Brook University School of Medicine. His observation that Lyme disease is mostly an infection of children was corroborated by Dr. Christy Beneri, a pediatrician at Stony Brook Children’s Hospital. She said her institution encountered a wide range of tick-borne illnesses annually and that boys tended to outnumber girls in the number of infections. The most likely reason for the disparity, Beneri said, is the tendency among boys to play outdoors in wooded areas where ticks thrive. In the extensive pediatric research Beneri presented at the symposium was evidence of some children developing Bell’s palsy, a temporary facial paralysis that occurs when the Lyme bacterium affects a cranial nerve. The paralysis resolves with antibiotic treatment, Beneri said. Babesia are protozoa, or parasitic, infectious agents that home in on red blood cells, similar to the way a malaria parasite invades the same cells. “Cases in Suffolk County hover between 500 and 700 and this is just for the reported cases,” Benach said, noting that Suffolk has among the highest rates of many tick-transmitted infections because of the dense infiltration of the insects in county. Americans Consumer More Than 99 Percent Of World’s Supply Of Hydrocodone. The Washington Post (3/15) reports that Americans “consume more than 99 percent of the world’s supply of” hydrocodone, according to the United Nations. The article cites that the US allows more aggressive marketing of prescription drugs, the political clout of the pharmaceutical industry, and cultural beliefs of Americans as possible reasons for the disparity. A potentially deadly and highly drug-resistant fungal infection has hit 35 people since the Centers for Disease Control and Prevention (CDC) first warned clinicians last June to be on the lookout for the emerging pathogen. Another 18 people were found to be carrying the organism but were not sickened by it. Candida auris has been reported in about 12 countries on five continents since 2009, when it was first detected in a Japanese man. The fungal infection can cause serious bloodstream infections, transmits easily from person-to-person in healthcare settings, and can live for months on skin and for weeks on bed rails and other hospital equipment. Additionally, some strains are resistant to all three major classes of antifungal drugs, although so far all of the U.S. cases have been treatable with existing drugs. According to CDC, at least 28 cases have been reported in New York; however, infections have also been reported in Illinois, Maryland, Massachusetts, and New Jersey. "As soon as we put out that alert [last June], we started to get information about cases and now we know more about how it spreads and how it's acting," said Tom Chiller, CDC's top fungal expert, in a recent interview. Of the first seven cases reported to CDC last fall, four patients had bloodstream infections and died in the weeks to months after the pathogen was identified. Officials said they could not be certain whether the deaths were caused by the infection, however, as the patients all had other serious medical conditions. Washington Post (03/10/17) Sun, Lena H.
Many ED Visits By Patients Undergoing Cancer Treatment May Be Preventable, Research Suggests. The Cancer Network (3/6) reports that research suggests “a substantial portion of emergency department (ED) visits by patients undergoing cancer treatment may be preventable, and those potentially preventable visits account for a high percentage of the ED visit costs.” The findings were presented at the American Society of Clinical Oncology 2017 Quality Care Symposium. WHO Issues List Of 12 Bacteria That Pose Greatest Threat To Human Health. The Washington Post (2/27) reports that the World Health Organization released its first list of antibiotic-resistant “priority pathogens,” the 12 families of bacteria “that agency experts say pose the greatest threat to human health and kill millions of people every year.” The list is intended to help guide and prioritize research and development of new treatments. The New York Times (2/27, Subscription Publication) reports that many public health experts are concerned at “the rate at which new strains of drug-resistant bacteria have emerged in recent years” and “consider the new strains just as dangerous as emerging viruses like Zika or Ebola.” Although the Centers for Disease Control and Prevention issued a similar report in 2014, CDC specialist Dr. Jean B. Patel says there are some differences, such as the fact that the WHO list focuses more on fatal infections, while the CDC put more emphasis on the difficulty to treat the infection. PM Pediatrics ( a NEURCA member) is holding their 3rd Annual Conference on Pediatric Urgent Care on March 29-31, 2017 in New Orleans, LA. Please go to www.pucconference.com for more information or contact Dawn Richy at (516) 869-0650 ext. 282. Reuters (2/24) reported that research indicates “opioid pain relievers...often aren’t stored safely in households with” kids. Investigators found that approximately “one in three parents with children under age 7 reported storing their opioid prescription by locking it up, and” approximately “one in 11 parents with children between ages 7 and 17 remembered storing their medicines properly.” The findings were published in JAMA Pediatrics. Antibiotic-Resistant Infections Rise For US Children, Study Suggests. The Washington Post (2/25, Naqvi, 11.43M) reported “rising infections caused by a type of bacteria resistant to multiple antibiotics is causing longer hospitalizations and may mean a higher risk of death for children in the United States, according to a new study” published in the Journal of the Pediatric Infectious Diseases Society. The study “found that 3 out of 5 children admitted to hospitals already had an antibiotic-resistant infection – suggesting these infections are spreading more often in the community.” Additional coverage is provided by HealthDay (2/24, Mozes, 21K).